Picture heavy.....worth the buffering wait! Several months ago, a friend called and wanted to surprise her daughter with a Marilyn Monroe dresser for her birthday. 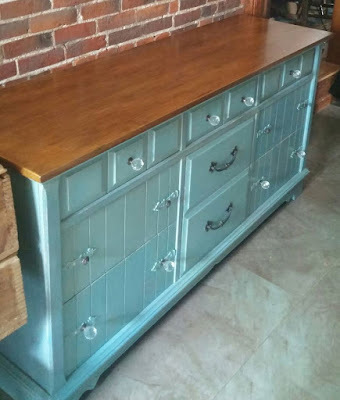 A thousand online dresser views later via Craigslist and E-BAY, thrift store hunts, and a shout-outs to friends, this came the closest to my specifications. 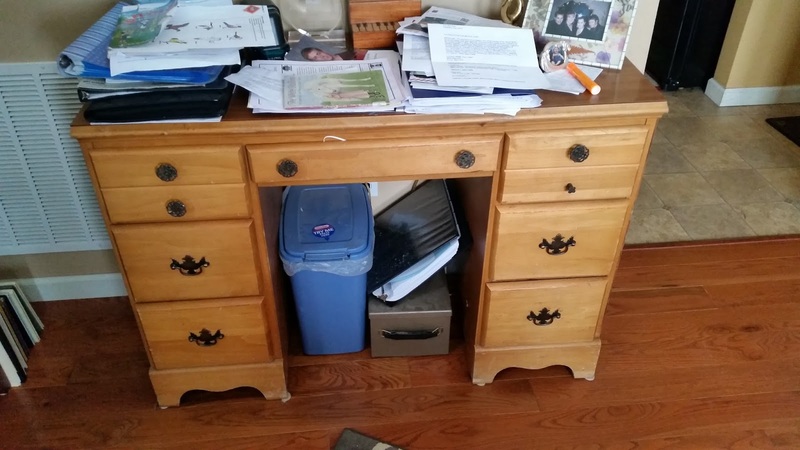 The top drawer on most dressers is the smallest. But, Marilyn's head required at least 9 1/2 inches. I could cut off her stubby polished toes but could not slice her face. I wanted no separations between the drawers and settled on this vintage piece from a Cleveland thrift store. After refinishing the wood parts that I wanted to preserve, and painting the shell black [shows up gray until lacquered] I was ready to tackle applying the poster. A better camera would show the real glitter of this glamour dresser, but I was pleased with the results. 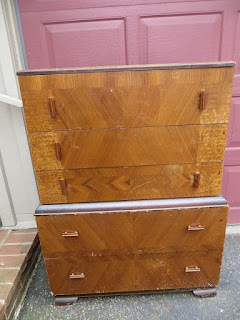 A curb find from my friend, Ken...this desk had a bottom drawer with no back. No problem-made a new one. Pardon the views, just turn sideways if you need to see if standing upright. This is how I work on it for gluing and clamping. Soon off to niece Meredith's house. Lilah wanted her Formica-topped pine desk with broken knob to have a new look. and....After. Color is Scotland Road for a Scottish family. I got a couple of these metal storage chests from another Craigslist friend, Stephanie. I thought they would be great for blankets and could hide them in plain sight. For the first one I chose my go-to first aid logo which I wrapped around so it would look good from any angle. Check back in a few weeks to see what the other becomes. This dresser came to my house in early May. Kathleen was hoping to pick up some tips on distressing and refinishing it herself to become the vanity for her bathroom. Well, it became a fixture in several rooms in my house until this week. She developed some pretty severe shoulder problems and could not work on it past day one. In person, the glass knobs sparkle. The direct sunlight hides the blue-green-grey highlights. This mid century dresser was a gift from friend Traci. Originally I did not have much hope for restoring this piece. It smelled musty and had some veneer problems. Besides, it was HEAVY. When I finally took it apart I understood why. Really good furniture have dust boards between the drawers and this had it in spades. Plus, the bottom drawer was lined with cedar and had a hinged lift up panel for storing sweaters and such. I stripped off about 5 layers of lead paint. Finally, I just used a razor blade and chipped it off. The drawer fronts and top I stained and poly'd. The rest, [after I had my brown base], I painted a medium gray and then Indian Red and distressed for some surprise color. Before working on it I suggested this dresser to about 10 people. All declined. Just like The Little Red Hen, I decided to keep it for myself as my dressers were given up in the relative relocation. When you stumble across an odd shaped piece of wood that is ready to be pitched in the wood stove, consider first the possibilities as a non-heat source. It turns out this was really a watermelon! These chairs were painted white and a gift from Cindy who/whom I met on Craigslist. She wanted to buy a chair I had posted. In the end, I traded the chair for these 2 which I ended up painting and upholstering for my niece Meredith. Cindy also gave me two paint sprayers. I was definitely the winner. Her father called me later and entrusted me with the restoration of his childhood chair. He gifted it to her for her birthday. The condition of the rush seat would not hold another child's bottom in its current state. I heated some boiled linseed oil and penetrated both sides of the seat. Then I wiped it with a tung oil. What a transformation. Friend Lynn added "Dad's" childhood nickname. My friend Ken (again) found me this Mid century table that had contact paper stuck to the top glass. I was not able to get the marks out of the glass so removed it and instead attached my signature lath boards. The table now graces Bethy's guest room as a side table. One morning Ken (friend of all, especially the planet) texted me on his way to work that this credenza was sitting on the curb in Lakewood. He warned that he could hear the trash trucks in the neighborhood. Believe me, I am NOT FAST anymore, but I beat the garbage truck by taking the freeway and racing through 5 suburbs. I had trouble wrangling it into my van so the owner helped me. I bought her breakfast. It found a new residence in Kim's dining room. I painted the top to look like zinc. While I was at it I took apart and refurbished her Grandma GG's round table. I took out over 40 superfluous nails. One day while in Habitat's ReStore I came across this broken mailbox. Even in pieces it was in better shape than mine. Neighborhood pranksters used it for target practice with a baseball bat (unlike a cricket bat). I thought I could restore it to look like a miniature of my house. I reconfigured the door, added batten strips and painted it overall. Okay just one more. This coffee table left my studio Sunday for an Italian man cave. Joined the link party at Bliss Ranch. Great work! Your mailbox really screams hope & salvage. I know. I had to put a muzzle on it. Thanks, T.
Wow I am in love with that Marilyn dresser!!! I think I have a poster of her somewhere and might put that on my list of things to do. So artistic you are!!! Cheers. There are so many good choices for posters on dressers or chests. Marilyn, Audrey, One Direction. My daughter wants a New Kids. Right now I have a request for a Lady Gaga. Thanks for writing Karen!